can you get just the bed LID only? I don't need the entire bed just the lid! I got me door sills today in the mail, Brushed Munimula! Oh My GOD! They are a work of art. I don't even want to put em on. I thought it was awful funny when I received this large box on the pourch and it was the door sills. They came in three seperate boxes inside one another. WOW! Talk about packaging! They are beautiful.................... Scary huh! Thanks for the info Marc!! Although I've had very little problems with my 04. I feel the same way you do. I would like to trade up too. Not at that much of a loss!!!!!! How can it be possible that a vehicle losses 50% of it's resale value? Arn't they available through GM now??????? I would like to trade up too. Not at that much of a loss!!!!!! Because of supply and demand, sad to say. There's plenty of new inventory sitting on the dealers' lots, so that results in a downward pressure on used vehicles. Just to let you guys know. 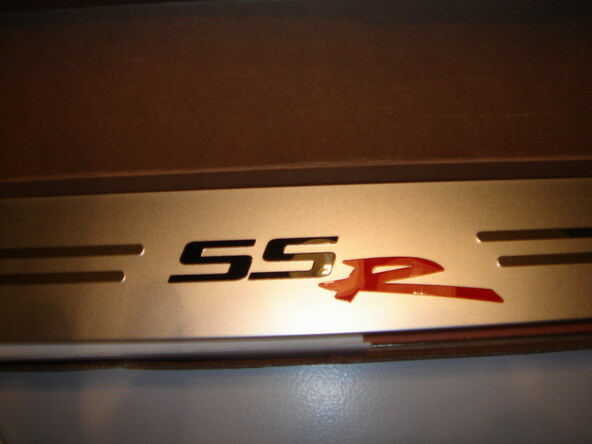 A few weeks ago I had the Rhino Linning sprayed in my '05 red SSR. That plastic linning was getting all chewed up. It looks fantastic and works great. If anyone wants to see a pic, let me know. I need to take a few and put them on line. Hey I finally got around to installing my door sills and WTH. One was missing so I e-mailed GMPARTDIRECT.com and they said for me to send a pic of the part and the box. I asked them if they were in seperate boxes and they said I should have received two door sills and one tail gate sill. I immediatly said WOH a truck sill. I didn't know they had a tail gate sill. They told me they were going to try and help me out as soon as possible! I hope eveyone else knows what you should get for $143.00! Are the sills in yourr pics the satin chrome or the bright chrome and do you get left and right side for the $112.00 price. Under the quantity collumn it says 1. Is that 1 kit = 2 sills? Did you ever receive a sill for the tailgate? When I ordered mine thru my dealer I only received one for eash door. Just wondering if there was a mistake or did I order the wrong part #. They really do look great. Glad to have then. What are the parts GM numbers for both the bright and satin chrome? Hey, I just wanted to tell everyone if you're looking for OEM accessories, I got a great deal over at www.AllDisountParts.com. I ordered some parts for my SSR and they were so fast. The prices were cheap and the service was exellent. My accessories were sent out the same day and I got my parts in just a few days. I would recommend them to everyone. I spoke with Chris and he hooked me up with everything. I will use these guys again. I never did get the tailgate one. Really SUX because I'm sure it would be really nice! Chevy SSRB Were you able to order the door sills and tailgate sills from your recommended supplier? How much? Scheide. 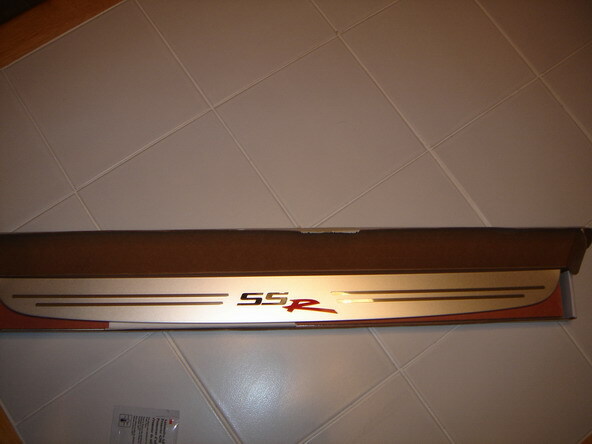 05 silver running boards no lein on this one"Silver Bullit"
It has been so helpful as a new owner to place orders for accessories! I found a few items there that other sites did not have. GMPartsDirect is having a tremendous sale on remaining parts in stock! Cockpit Windbreaks and Color Keyed and Satin running boards are about 50% off. I just got my silver '06 last week and have an accessory question that the dealer hasn't been able to answer. On the transmission hump there is a square slide-mount to hold the detachable cup holder. The slide mount works great for the passenger side, where the tracks are horizontal. But on the driver side of the hump, the slide mount is attached so the tracks are vertical. It won't hold a cup that way. Is that the way it is on your vehicles? Is there some tricky little thing I need to do to make this work? There is a different cup holder for that mount....You will need to order it from dealer..
Watch eBay for them. They come up for sale quite often. just joined... also in Houston (close).. where did you get your bags? I would not hold your breath for the rear sill plates, I think you will find that it is not available. Make your on. Do the search thing on sill plates. I've got pics out there some where of the one on mine. That's a sill plate on the air dam I bought from MIKE in the desert.